Newcomers Josh and Jonathan Baker – twin brother filmmakers – focused on the family dynamic of three males from Detroit, who without their dead wife/mother seems destined for dereliction, even with the influence of a honorable working class Dad. 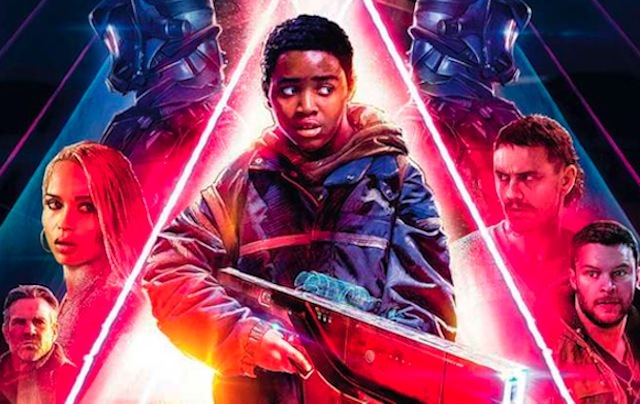 The twist is that the youngest son – an adopted African African boy in a white family – has discovered a weapon, not of this earth, that only he can discharge. When his older brother and he hit the road, there are many factions out to get them, but the weapon itself becomes a saving grace. The whole story works as it evolves, despite some weakly drawn characters, and the last quarter of the film is almost classic. Eli (introducing Myles Truitt) is rummaging around an old factory in Detroit, looking for scrap wire to sell. He comes upon what looks to have been a shoot-out, with several armor clad individuals dead. One of the discarded weapons fits neatly into Eli’s hands, so he takes it home, where his father (Dennis Quaid) is anticipating the return of his brother Jimmy (Jack Reynor) from prison. Father and prodigal Jimmy clash, mostly because the son owes a crime lord named Taylor (a hammy James Franco) 60K for his prison protection, and Dad is also angry at Eli, when he discovers his pilfered wiring scam. It doesn’t get any better when Jimmy and Taylor decides to rob his father’s work site for the money, but the heist goes wrong, so Jimmy grabs Eli (who brings his weapon) to escape. They hit the road, and collect a stripper named Milly (Zoë Kravitz) along the way.